On Thursday July 26th S.O.U.L. 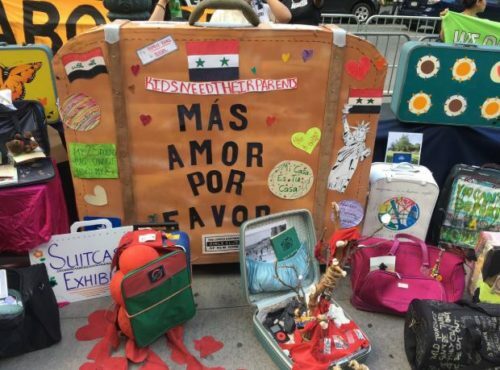 Sisters attended the Deportee Suitcase March, supporting the #WhatWouldYouPack campaign. 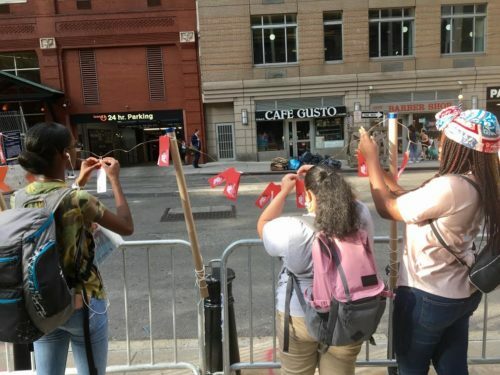 Participants were asked to bring one item they would pack for their loved one, and we brought menstrual pads to raise awareness of women and girls’ issues among the many issues of detaining and separating families. At the demonstration we were met with people of all ages, genders, and races protesting. There were plenty of signs, many in Spanish, with messages to abolish ICE, save their loved ones — like “Justice for Maria” — or of families telling their stories. Of the many chants at the event, one I found very clever was saying “MELT THE ICE, MELT THE ICE”. The energy of the crowd brought a sense of unity and hopefulness. 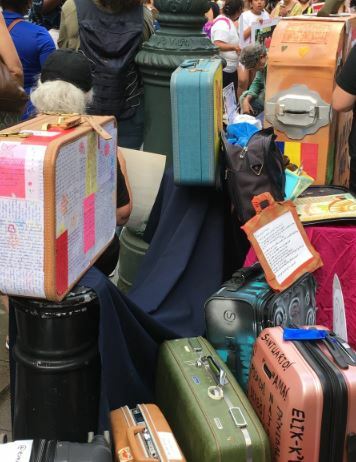 In front of the steps on Lafayette was an array of luggage of all shapes and sizes. Some were decorated with drawings and paintings, others had heartfelt messages on them. One was open with pictures of loved ones, a Bible, and a small tree which represented growth and new beginnings. The “Thinking of Loved Ones” Exhibition on Worth Street was a long clothes line that ran through the whole block and consisted on luggage tags tied around it. The purpose of this was to show how major airlines benefit from deportation flights. The activity consisted of writing down a family members name on a tag and checking the boxes that applied to them. On the bottom on the tag was listed various airlines that contribute to the profiting of deportation flights. While filling out my tag, I had no idea of who to think of or what to write down. My family had been living in New York for years, and the rest were all settled in Antigua. Then, I though of my cousin Lamont from Antigua, who just started studying at Lehman College. His whole life, he dreamed of going to medical school and has traveled miles from home to make it come true. The thought of him being deported hurts my heart, that he would be forced to leave behind so much, only to lose what progress he’s already made for himself. I hung up the tag and notice the hundreds of others along with mine. It was a sign that there were others who felt the same as me. At the march there were about 5 different Homeland Security vehicles that were parked along the blocks. The officers were at every corner of the block watching everyone who passed. There presence reminded protesters that deportation is an ongoing threat to undocumented migrants in this country. As we made our way to the next demonstration on education of immigration laws, we heard a speech by Cesar Barros titled ‘Who Benefits from the Detention and Deportation Machine.” He called out the border system in America, explaining how immigration systems are used as profit: from building detention centers to clothing to food, Barros highlighted the costs of detaining people and the businesses that profit from their pain and separation. Throughout the march, we were handed many informational pamphlets and papers that explained the history of immigration law. Others explained a list of corporations who benefit off of every person who is deported. Later we made our way back to the main event of the march and met a woman named Emma involved with RefuseFacism.org. She had two large signs that pointed out their mission and the call to action on ending the Trump/Pence Regime. 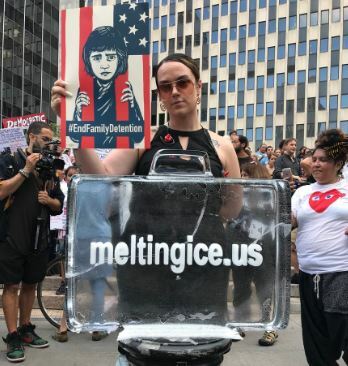 Her signs included a picture of a young girl at a detention facility. Our NY Program Coordinator Melissa Centeno, pointed out the lack of pictures of girls at the detention facilities. She explained the constant use of boys in these pictures make it seem more manageable for the viewer. Otherwise, seeing a girl under those conditions would seem unnatural or dehumanizing. In other words it’s just the government’s way to censor the truth of what’s really happening. The experience of this March brought joy to my eyes. Seeing all these individuals who were brave enough to fight for something they believed in was more than I can imagine. It is said that the first part of solving a problem is to realize its there. Then once we get over that first step then where do we start? We have to remember that there’s always strength in numbers. We have to remember in times like this we must come together to stand up for the the ones that can’t stand on their own. That small suitcase is more than what it is. It’s the pain of families tearing apart. The pain of leaving behind all you know. It’s the pain of not knowing what’s to come. But that same pain is meant to be heard, it is strength to say enough is enough. The voices will finally be heard and change will soon come. This march was the start of finding the strength in ourselves to stand up for what’s right. To protect every immigrant that has the right to a safe and happy life.